On my second day I visited the symbol of Osaka “Osaka Castle”. From the station, it was a long walk to the castle. The castle outside and by far is really wonderful. It’s quite a long walk but worth to see and impressive. One of the charms of this castle is the beauty of its stone walls. First, get your tickets before going to the castle, about 600¥ each. If you don’t want to line up in the queue and can just proceed to the entrance instead. I suggest you to get the Osaka Amazing Pass. When you enter to the castle you need to take the elevator going to the 5th floor (half way) only accommodates few people at a time, so there is a little wait going up. But you can opt to use stairs, like I did. There’s a very nice viewing platform on the top, so even if you’re not that interested in seeing all the historic artifacts and you might be a bit tired after all the stairs and possibly a warm day, the view is worth all the steps to top! If you are keen to know the history of the castle, you can walk to the lower floor by taking stairways. Each floor is captivating which you can check out the museums, showcasing the history and culture of ancient Japan (photo taking is prohibited). There is even a section for you to don a helmet or soldier’s warrior outfit and take a photo with a backdrop of Japanese garden (got fee). It’s amazing what they’ve been able to do with the exhibitions inside the castle in a very limited amount of space, although it’s on the heavy reading side of things. Note that restrooms are only on the 2nd floor. Small gift shop on the top floor but a bigger one awaits in the ground floor. Try getting a memorabilia key chain with your names engraved on it. It’s on the ground floor and its a DIY ( instructions in Japanese but visuals are easy to follow). I visited the castle in the Spring and the cherry blossoms were beautiful in full bloom, it was great to walk through the park lands as the wonderful castle was surrounded by full bloom cherry blossom. Its not the best castle Japan has to offer but it’s still pretty good. 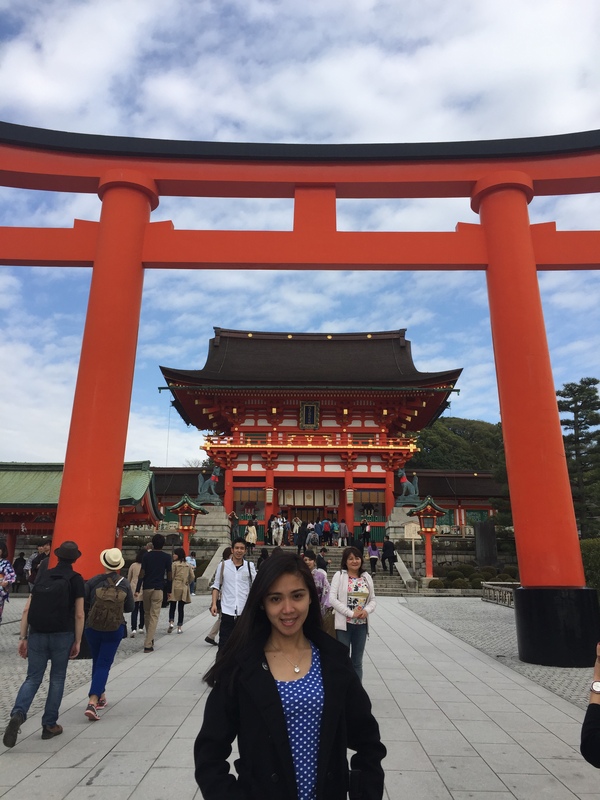 After my Osaka Castle visit I went to see the important Shinto Shrine in southern Kyoto. It is famous for its thousands of vermilion torii gates, which straddle a network of trails behind its main buildings. The trails lead into the wooded forest of the sacred Mount Inari, which stands at 233 meters and belongs to the shrine grounds “Fushimi Shrine at Mount Inari”. To get here from Kyoto station, take the JR Nara line to Inari. I went here to explore the mountain trails. The hike to the summit of the mountain and back takes about 2-3 hours, however, visitors are free to walk just as far as they wish before turning back. After about a 30-45 minute ascent and a gradual decrease in the density of torii gates, visitors will reach the Yotsutsuji Intersection roughly half way up the mountain, where some nice views over Kyoto can be enjoyed. As you climb higher, you will find out that there are fewer and fewer people, sometimes even no people at all. A little higher up, past a few smaller shrines, and you will have reached the summit of Mount Inari. A long, uphill walk on a narrow but colourful street with lots of vendors and restaurants, packed with tourists, takes you to the shrine which commands an impressive view of the city. So do not worry if you are thirsty or feeling slightly hungry as there are food and drink stalls at the higher parts. Once you have finished hiking, don’t forget to get some street food just beside the temple. Daylight is fading but my voyage didn’t end yet. I headed to Bamboo Forest in Kyoto, it’s a short walk from the train station. The place is accessible by JR train line – take the Sagano line from Kyoto Station then alight at Araishiyama Station. Seems so easy but I am really not good in direction and was confused how to get there. I managed to asked a local that pass by if which way should I take to easily get there but he never answer. I noticed he wanted to explain but having hard time to say it in english but I was surprised because he sent me there. All the while he just told me to follow him because he is on the way there (in action) but the truth he intentionally just sent me there and after awhile he left with a smile. Japanese are really so helpful and friendly. Here I am at Kyoto’s top sights “Arashiyama Bamboo Grove/ Bamboo Forest”. The walking paths that cut through the bamboo groves make for a nice walk or bicycle ride. The groves are particularly attractive when there is a light wind and the tall bamboo stalks sway gently back and forth. This is just a beautiful rural area very close to Kyoto. Calm and picturesque. I didn’t manage to stay so long since its getting dark. I just snapped a photo and had to leave. If you are a nature lover, this place is a must see. My last stop was Dōtonbori and was easy to find, I took the subway Hanshin Main Line towards Umeda then Midosuji Line towards Nakamozut and alight at Namba Station then walked 5mins to Dōtonbori. Dōtonbori is one of the principal tourist destinations in Osaka, Japan, running along the Dōtonbori canal from Dōtonboribashi Bridge to Nipponbashi Bridge in the Namba district of the city’s Chuo ward. Historically a theater district, it is now a popular nightlife and entertainment area characterized by its eccentric atmosphere and large illuminated signboards. One of the area’s most prominent features, a billboard for confectionery company Glico displaying the image of a runner crossing a finishing line, is seen as an icon of Osaka within Japan. If you are new to Osaka, this is definitely the place to go! One of the busiest shopping district may it be daytime or nighttime. Thousands of neon lights and a lot of shopping areas, restaurants, food vendors, and tourist shops/attractions. You can get nice shoes, heels, clothes at quite a reasonable price as compared to Tokyo. Walk further down there are also few departments store where you can get some branded stuffs like Burberry (Blue Label). The street is just compact with good local Japanese food (love the ramen so much!). Every night I went Dōtonbori simply because I want to eat Ramen and there is so much to see! You must try the best local ramen rastaurant “Kamukura” & “Kinguemon”. Must eat takoyaki! The trip to Osaka would not be complete without a visit to Dōtonbori, so dont miss it!